This course helps students learn to evaluate Tolkien’s works both individually and comparatively, judging them in the context of each other as well as of their sources. How does “The Story of Kullervo” relate to Kalevala? How does Sigurd and Gudrún relate to The Volsung Saga? How does The Fall of Arthur relate to the medieval Arthur legends? Tolkien once said his immediate response to reading any medieval story was to want to write one like it. He did. Three times. “The Story of Kullervo” came from the Finnish Kalevala; Sigurd and Gudrún was his take on the Icelandic Eddas; and The Fall of Arthur was inspired by the Middle English Alliterative Morte Arthure and the Stanzaic Morte Arthure. We’ll read each of these works in the context of its particular literary tradition to explore how Tolkien fits/alters/extends/compresses traditional material to make it his own. The course divides naturally into three segments each devoted to a mythic story and Tolkien’s treatment of it. 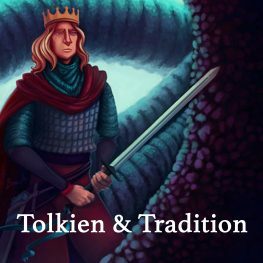 You will learn to evaluate Tolkien’s works both individually and comparatively, judging them in the context of each other as well as of their sources as read in class. The folklore movement, myth, language, romanticism, nationalism. Lönnrot, Proto-Kalevala 1834, Old Kalevala 1835, Kalevala 1849. Folklore or fakelore?